A look at the investment case for UPS for Warren Buffett followers. According to Berkshire Hathaway's (NYSE:BRK-A) latest quarterly SEC filing, Warren Buffet's investment vehicle is holding nearly 60 thousand shares in United Parcel Service (NYSE:UPS). While it's one of his smaller holdings, the investment guru is known for only taking positions in companies he's willing to hold for the long term because he believes in their core value. That said, let's take a look at the investment case for UPS and see whether it's a Buffet-like stock or not. Given Buffett's preference for long-term investments with sustainable cash flow streams, UPS appears to immediately fit the bill. Alongside FedEx (NYSE:FDX) and Deutsche Post's DHL, UPS is one of the dominant forces in express and courier service. Throw in the long-term growth opportunity from burgeoning e-commerce demand and UPS looks well set to generate a steady flow of earnings and cash flow for years to come. Not all e-commerce packages are easy to deliver. Image source: Getty Images. 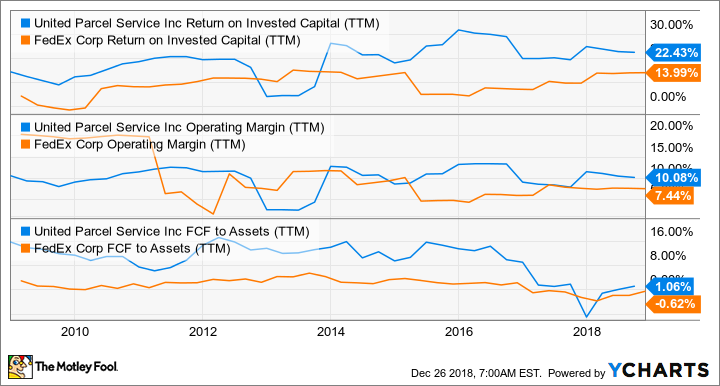 Moreover, a quick comparison of some its operational metrics with FedEx's shows that UPS tends to have a higher operating margin, earns higher returns on invested capital, and also generates more free cash flow from its assets than its key rival does. UPS Return on Invested Capital (TTM) data by YCharts. Is it an open-and-shut case for UPS being an archetypal Buffett stock? Unfortunately, it's not quite that simple. While a cursory look suggests UPS is a perfect fit, a closer look at the details of its performance in recent years suggests otherwise. In a nutshell, the company has faced three stumbling blocks that have forced the company to change its approach to business. Consequently, it's become harder to judge UPS's long-term cash flow. E-commerce growth has been positive for volume growth, but it's created margin challenges. The pressure of delivering a good service during peak demand days in the holiday season has led to profit shortfalls and the need to expand network capacity. UPS has been forced to increase its capital spending in order to modernize and expand its network in order to service e-commerce growth. The three bullet points above are all somewhat related and systemic in nature -- FedEx has also had similar issues. E-commerce shipment growth is good news from a revenue growth perspective. However, as you can see below, UPS and FedEx have seen margin pressure in recent years due to a combination of the difficulties of dealing with peak demand days and the fact that many large e-commerce deliveries -- mattresses and trampolines, for example -- can be bulky and/or inefficiently packed. Data source: FedEx and UPS presentations. Chart by author. Turning to the issue of the difficulty of predicting and managing peak demand days during the holiday season, it's clear that FedEx has done a better job than UPS has in the last five years -- perhaps a consequence of a lack of capital investment by UPS in its network. For example, the problems resurfaced again last winter when peak demand volumes exceeded management's expectations and UPS's US domestic package segment saw operating profit decline slightly in the fourth quarter of 2017. UPS has had these issues before. For example, in the winter of 2013 to 2014, UPS took a hit from a lack of capacity (third-party transportation costs soared in order to meet demand) and in the winter of 2014 to 2015 UPS found itself with too much capacity on peak days -- costs overran. The first chart above shows how UPS has traditionally generated more free cash flow from its assets than FedEx has -- something that Buffett would surely welcome. However, as noted above, the pressure on its network from e-commerce growth, particularly during peak demand periods, has forced management to ramp up its capital spending plans -- something that will eat into its ability to generate free cash flow. For example, going back to the fourth-quarter earnings given in February, UPS announced it would ramp its capital expenditures up to 8.5% to 10% of revenue for the next few years. As you can see below, this represents a significant increase from recent years, and analysts will surely have had to pare back their cash flow projections as a consequence. While a period of a few years elevated capital spending won't deter long-term investors like Buffett, it's far from clear that the increase isn't going to be the new normal. 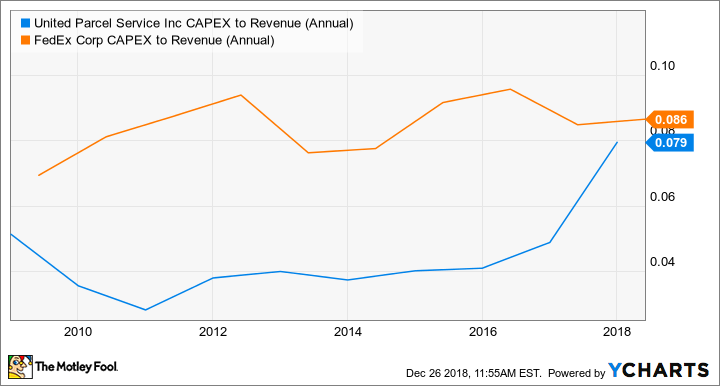 For example, as you can see in the chart below FedEx has consistently made capital expenditures at around 8% to 10% of revenue, and UPS may be forced to follow suit over the long term. UPS CAPEX to Revenue (Annual) data by YCharts. Is UPS a Buffett-like stock? The obvious answer is yes because Berkshire Hathaway holds it! However, for the reasons outlined above, UPS might not quite be the type of stock that Buffett followers want in their portfolios. All of which is not to be too harsh on the investment proposition for UPS -- it has merit and, to be fair, the company is taking the right measures to get back into good shape. It's just that if you are looking for a company with a stream of predictable cash flows in a steadily growing industry, UPS might not quite be the first choice.